The oven shown is a “Continuous Web” oven. The oven is designed to transport a web of material through a heat chamber for drying and/or curing the material or coating on the material. There are a number of methods for conveying a continuous web. The method depends largely on the material itself. Typical materials processed in a continuous web oven are fabrics, films, non-woven blankets and new formulation geotextiles. In applications where a cooler is needed to reduce the temperature of the product prior to the next processing stage, the interface between oven and cooler is critical to maintaining product stability. 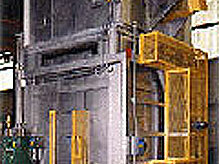 LOADING usually involves transferriing from another dddevice such as a mandrel or product forming machine through guided rolls into the oven chamber. UNLOADING also involves a similar transfer. This time it is from the heat process to a follow up process, which typically involves other machinery. Whether it is another part of the production of the product or shipping the product the nature of “continuous web” processing uninterrupted, untouched processing. HEAT TRANSFER to the product and SUPPORT of the product must be considered together in the design of continuous web ovens. Depending on product characteristics it may be necessary to not touch one surface due to coatings. Product strength and stability as it changes temperature must be considered in the handling mechanisms. Application to one side or both sides determines orientation of the heat source. Some methods used in continuous web ovens are floating the product, carrying over highly polished rolls or arched duct sheets or just pulling with high tension rolls. EXPANSION AND TAKE-UP are also factors that determine design of the product carrying method. Since the product runs continuously through various environments and stages of its own make up it generally shrinks or expands, becomes sticky or slippery. These changes must be compensated for in precision designed expansion and take up devices. ACCESSIBILITY is an important consideration for maintenance and product inspection purposes. Pre planning for access to certain areas in the heating process can save time and money in the long term effective use of continuous web ovens. Any break or disruption in product flow must be corrected quikly.